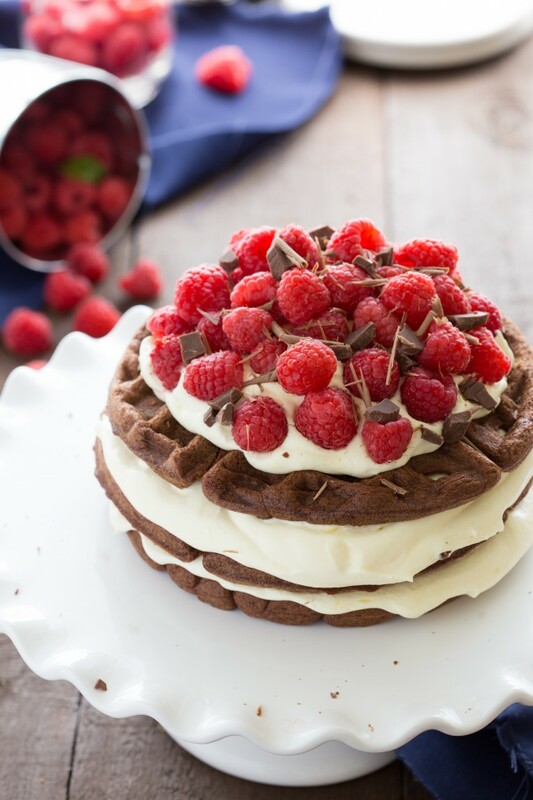 A tri-layered fudgy chocolate waffle pie that is ready in less than thirty minutes! This delicious recipe looks impressive and will be the hit of any party, but secretly takes very little preparation. For me, when I see a pretty layered dessert I instantly think it’s time-consuming and/or difficult to make. So here’s the great news about this pretty layered dessert – it could not get any easier! It’s one of the quickest desserts I’ve ever made too. Which is a good thing, because, well, I had to make it twice. Right in a row no less! Apparently my baby is growing faster than I can keep up with… Usually I take all of my pictures while he was taking a nap, but sometimes when he refuses to sleep, we take pictures together. And by together, I mean he usually sits right by my feet playing with toys while I snap some shots. 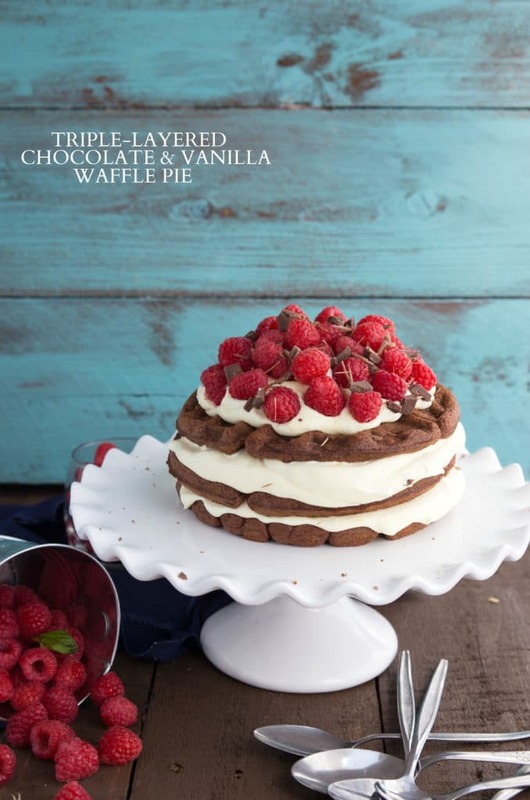 To make this dessert very simple, I used a chocolate cake mix for the waffles. Basically you just make up the cake mix according to the directions on the package and cook it right in your waffle maker. How easy is that? I actually came up with this dessert because another one of my mom’s go-to desserts growing up were chocolate waffles. She would make a chocolate cake and then we’d make waffles out of it, top it (while it was hot) with tons of ice cream and chocolate syrup. SO good. 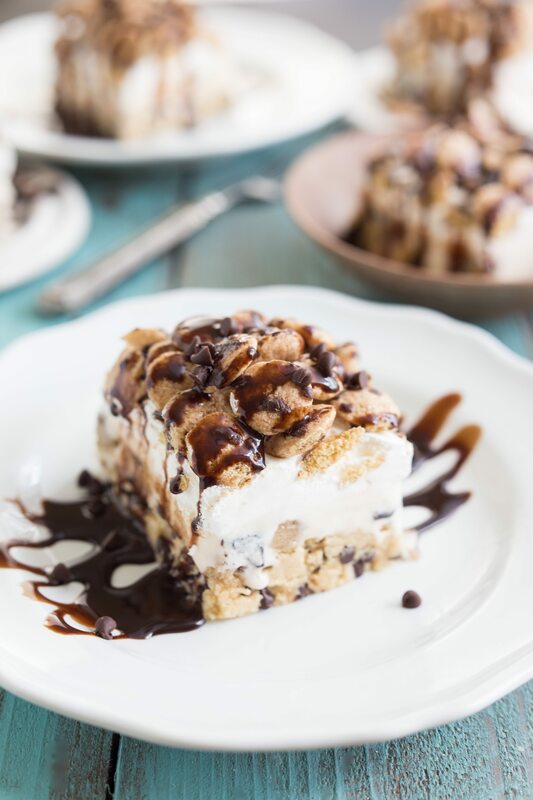 Although the filling isn’t ice cream, you could freeze this pie and make a sort of ice cream pie out of it. The filling is, instead, whipped topping, vanilla pudding mix, and milk. I used Jell-o instant pudding mix with 2 cups milk (I cut out 1 cup that is typically called out in the directions). That mixture goes in the fridge for 5 minutes while the cake waffles are in the waffle maker. 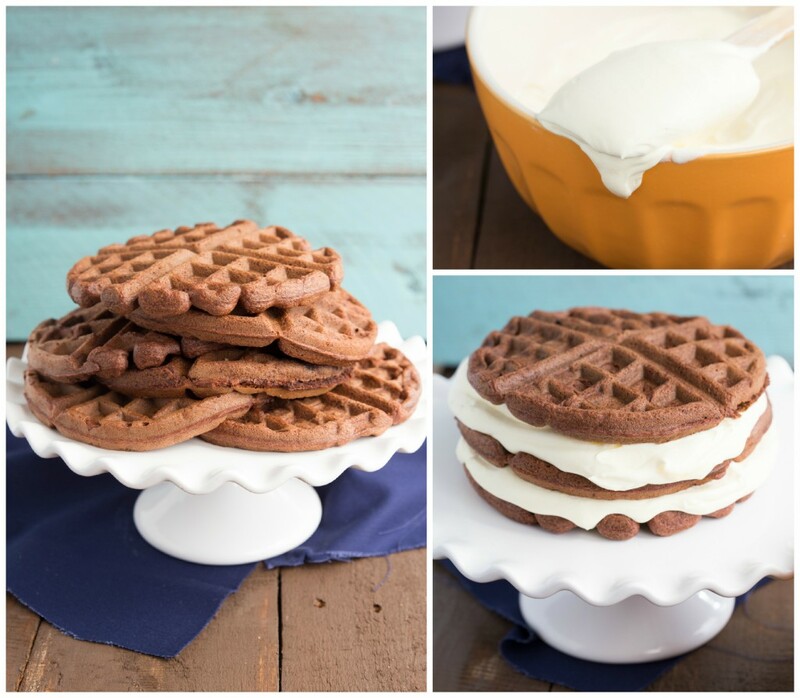 After the pudding is soft-set, you fold in the whipped topping and that is layered in between the chocolate waffles. 3 waffles and 3 pudding/whipped topping layers. And, my favorite part comes last, the berries. Aren’t they pretty? I love raspberries and strawberries! I couldn’t decide between the two but finally ended up with raspberries since the little guy doesn’t have those as often as strawberries. Of course, last but not least, is the chocolate shavings and pieces. I just took a small chocolate bar and shaved off some pieces with a vegetable peeler. Then I broke off the rest of it into small pieces and just placed them around the top. This is, of course, optional but it totally makes the pie in my opinion! Grab a fork and a slice – this stuff is gooooood! Preheat your waffle maker to manufacturer's instructions. I preheated mine to high. Pour a heaping (depending on your waffle maker size you may need to adjust this number) 1/2 cup of the cake mix into the waffle maker. Close and allow to cake mix to cook. When it's finished cooking, remove and allow to completely cool. Repeat step 3 until all of the cake mix is cooked into waffles. I was able to get 6 large waffles from the cake mix. Meanwhile, whisk together the pudding mix and milk until completely combined. Place in the fridge for 5 minutes. Remove the pudding and gently fold the Cool Whip into the pudding until completely combined. On a cake stand or plate, place one waffle down. Spread the pudding mixture on top. Place another waffle (make sure these are completely cooled down!) on top. Add another waffle and then one more scoop of the pudding mixture. 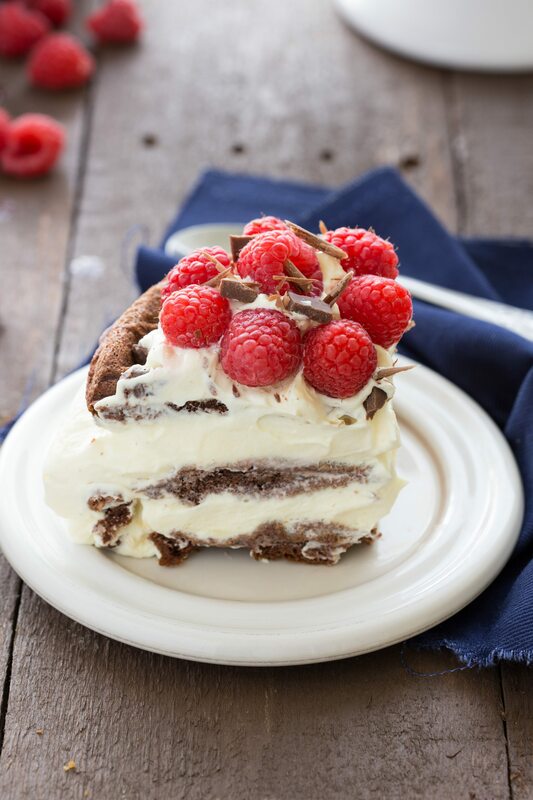 If desired, garnish with fresh berries and chocolate shavings. Make the chocolate shavings by shaving a chocolate bar with a vegetable peeler. You can also break up some of the candy bar and place the chocolate chunks on top. Cut into slices and enjoy immediately. 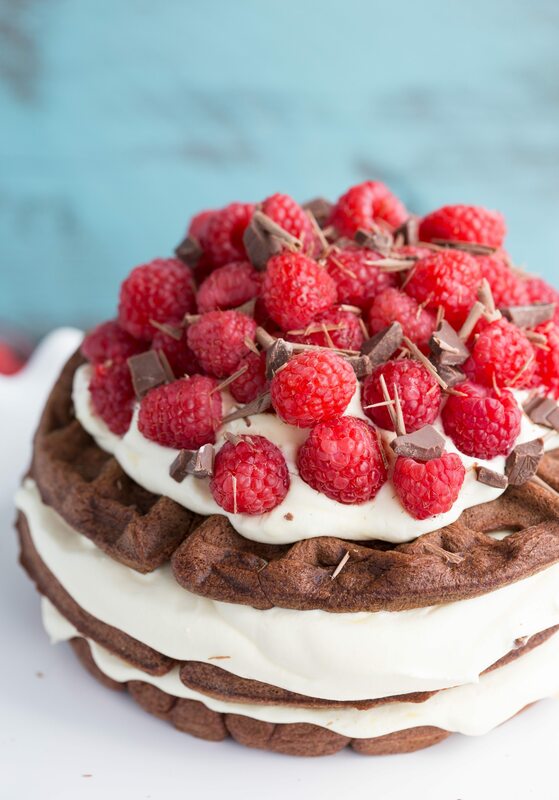 Wow super impressive waffle cake pie! I’d love a slice right now! Easy and beautiful! What a stunning chocolate cake. Just love that it’s made of waffles too! This is such an awesome idea! 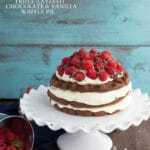 Each part of it looks delicious, and the presentation is so pretty with the raspberries and chocolate shavings on top! Oh no! That stinks. It’s so pretty though that I bet you had fun making it again. Well good thing your babe is okay and secondly, thank goodness this dessert comes together in a flash! 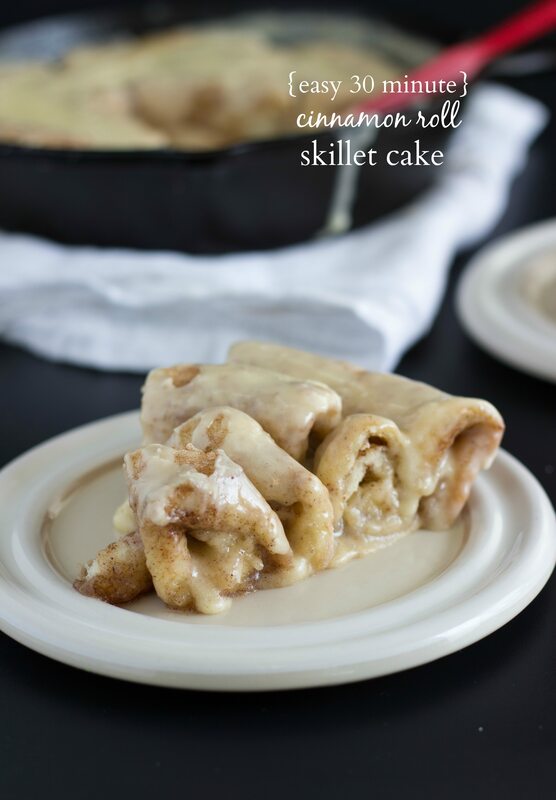 These types of desserts are calling my name since I think I am baking impaired – they never turn out for me! Pinned! Omg, I love the waffles! That is such a great idea for cooking cake quickly! I’m totally going to have to try that. Your mom’s version sounds amazing as well! Ice cream and waffles!? Yes, please! 🙂 Have a great weekend, Chelsea! It’s hard to believe that this dessert was easy – because it’s beautiful, like art! So pretty and elegant – I’d serve it to fancy-schmancy guests! 🙂 And, I loved the story how your baby plays at your feel while you shoot – so sweet! Pinned! Wow, what a beautiful stack of waffles! I was sold as soon as I saw “Triple Decker”. Love the chocolate shavings! I saw this on Pinterest and was wondering who the creative genius behind this was…it’s absolutely gorgeous! WHY do I not have a waffle maker?!?! Yikes, I’m so glad Grey didn’t get hurt and luckily this comes together easily. It looks absolutely beautiful! 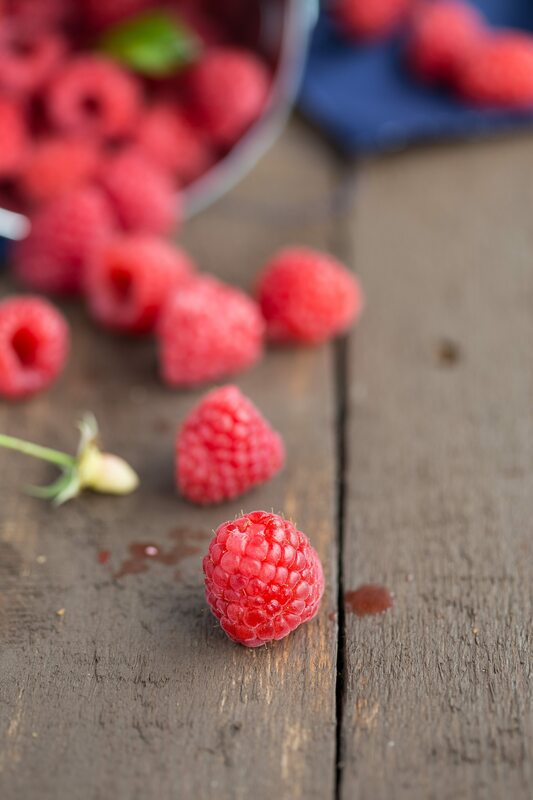 Love all those pretty fresh berries! Awesome recipe, beautiful presentation & gorgeous pictures :)! Such a great way to enjoy waffles, I should give this a try soon while raspberries are still in season! I just love the way your mind works! SUCH a perfect idea-it’d be amazing for a fancy brunch or a birthday breakfast! What a neat idea, waffle pie! Love your pictures too, they’re gorgeous! This looks INCREDIBLE! Plus, it’s so easy with the use of a cake mix. I love it! Mmmm. I cannot wait to try these.